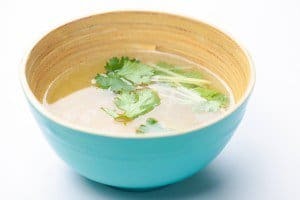 I’ve been making a lot of Chinese home-style soups lately – Nathan has been going through some health challenges lately and all he wants to eat is clear soup. My house smells like Mom’s house when I simmer a pot of soup. 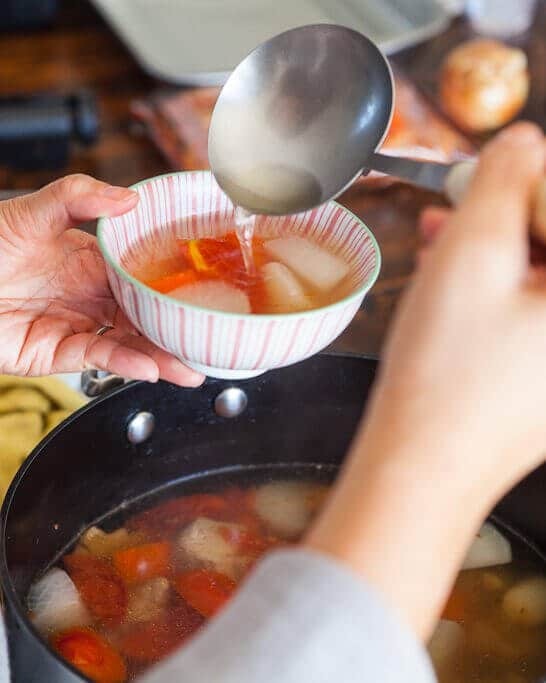 One most frequently asked questions I get is, “what’s your favorite recipe from your Mom?” It’s tough to just pick ONE single recipe so I’ll pick my top 3 categories – Fried Rice, Crispy Spring Rolls and Soup – any Chinese soup. Soup is easy to make, but tough to master. Simply boiling ingredients and adding enough salt will make anything from flavored water to somewhat decent soup. 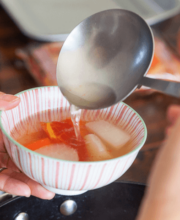 I’m talking about making a broth that’s rich and concentrated but also clear and clean. What is clear and clean soup? Well the French technique to making clear soup, or consommé, is to stir in egg whites. The proteins of the egg whites will collect and trap all of the sediment and fat from the soup, which then gets discarded. Use umami-boosting dried or preserved ingredients to create nutritional benefits, richness and savoryness – dried Chinese mushroom, dried shrimp, dried scallops, dried abalone, preserved turnip, dried dates, dried lily buds, dried figs….well, you get the picture. If it can be preserved/dried, it will….and the Chinese will use it for soup! 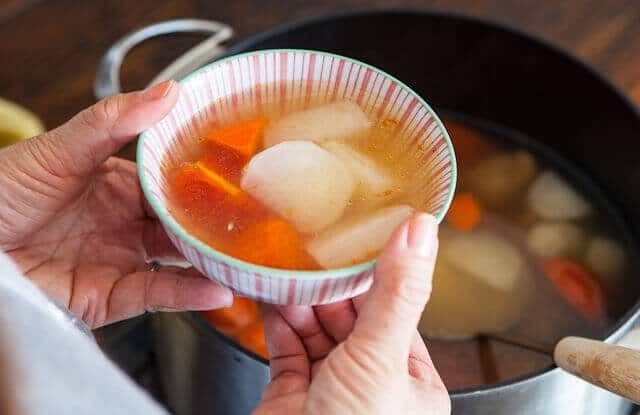 In this recipe for Chinese Diakon and Carrot soup – you can use one or both techniques. I bring a big pot full of water to a rapid boil, then add in my meat/bones. I let it boil like crazy. This violent boiling action “scrubs” the meat and bones, forcing the impurities to be released. Let this happen for 10 minutes and then discard the water and fill the pot with new, clean water to create the broth. The answer is no. Unless you count that scuzzy stuff as flavor. You don’t want that crap in your soup anyways. The real flavor of soup comes from a long, slow, gentle simmer of the meat and bones. Unless you use a pressure cooker, which I sometimes do too. But that’s a different sort of cooking technique. This recipe, like all of my recipes, is flexible. Don’t eat pork? Use chicken instead. No daikon? Try potato. No dried shrimp/scallops? It’s optional. 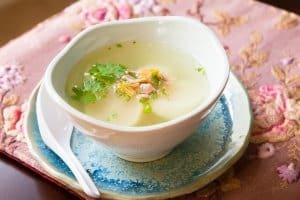 Chinese Daikon Soup Recipe with Dried Scallops (optional) – make this in a slow cooker, pressure cooker or stovetop. 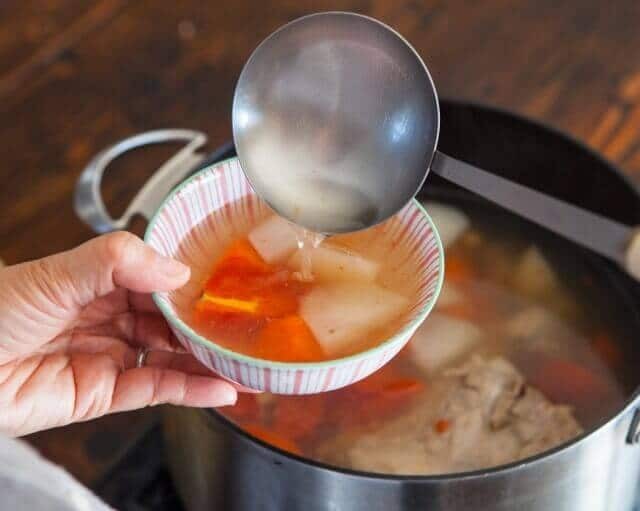 Bring a large soup pot filled with water to a rolling boil. Add pork and bones and let boil rapidly for 10 minutes. Remove pork and set aside. Drain and discard the water, clean the pot if needed. Fill the pot with new water to make the broth (approximately 4 quarts) and add in the pork, bones, shrimp, scallops, ginger, garlic. 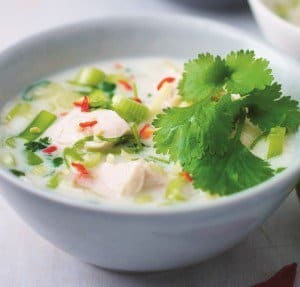 Bring to a simmer and then turn the heat to medium-low, or hot enough to just produce a gentle simmer for 30-40 minutes. Occassionally, skim the soup of any fats or particles and discard. Add radish, carrots and tomatoes to the soup and simmer for another 15-20 minutes. Season with salt (or fish sauce) to taste.